Fresh from the staggering success of The Truth About the Harry Quebert Affair, Marcus Goldman is struggling to write his third novel. A chance encounter in Florida throws him some inspiration from a surprising source: Alexandra Neville, the beautiful, phenomenally successful singer and Marcus's first love. All at once, memories of his childhood come flooding back. Memories of a family torn apart by tragedy, and a once glorious legacy reduced to shame and ruin. The Baltimore Boys. The Goldman Gang. That was what they called Marcus, and his cousins Hillel and Woody. Three brilliant young men with their whole lives ahead of them, before their kingdom crumbled beneath the weight of lies, jealousy and betrayal. For years, Marcus has struggled with the burdens of his past, but now, he must attempt to banish his demons and tell the real story of the Baltimore Boys. Joel Dicker was born in Geneva in 1985, where he studied Law. The Truth about the Harry Quebert Affair was nominated for the Prix Goncourt and won the Grand Prix du Roman de l'Academie Fran aise and the Prix Goncourt des Lyceens. It has sold more than 3.6 million copies in 42 countries. 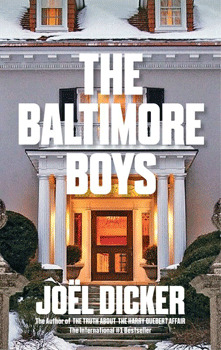 The Baltimore Boys, at once a prequel and a sequel, has sold more than 750,000 in France.